Daisy after completing her 22nd walk up Pendle Hill. A four-year-old girl, who took on the challenge to walk up Pendle Hill 52 times this year, is almost halfway there. Daisy Hooper completed her 22nd walk last night with her dad, Danny, and so far this amazing little girl has raised the grand total of £1,200 for Pendleside Hospice. Proud Danny said: "I want to make it a really big event when Daisy hits the halfway mark which will be her 26th walk. "People are used to seeing her now and so many stop to say hello and give us a donation.
" And at the end of each walk the Cabin Cafe at Barley gives her free drinks which Daisy loves." Plans are on the cards for a fundraising event at the Kingfisher Cafe at Barden Marina, Burnley, where Daisy's mum Sam is assistant manager. Danny and Sam are appealing for local sponsors for the event to help give the total raised a real boost. Daisy came up with the idea for the walk when she saw volunteers collecting for the hospice during a trip into Burnley town centre with her dad. When Danny (35) told her they were collecting for a place that looked after poorly people Daisy said she wanted to do something to help too. As the family are keen walkers it seemed the ideal thing for Daisy to do. Although she usually goes with her dad, Daisy, a pupil at St Mary's CE Primary, Newchurch in Pendle, is sometimes joined by the rest of the family which includes her mum, twin sister, Poppy, brother Jack (six) and little sister two-year-old Molly. And anyone who wishes to join Daisy on her regular walks is always welcome. When Daisy completes the challenge she will have trekked around 150 miles and will have climbed around 95,000 feet. 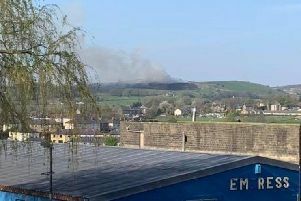 The family, who live in Lower Manor Lane, Burnley, have also appealed for help and support from local businesses and companies. Anyone who would like to support Daisy is asked to log on to www.gofundme.com/3qup2x-pendleside-hospice.